Super bargain ammunition for those who understand the benefits of shooting steel cased ammunition that aren’t trying to shoot matches in match grade equipment with them. 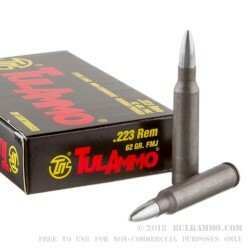 The Ultra value priced TulAmmo in .223 Remington is a perfect match for your midrange firearms that you just want to use to get lead downrange. This 62 grain projectile is very good for shorter twists but offers real versatility too, extending up into the more mainstream barrel twists too. It’s a good middle ground for those who want to stockpile ammunition for SHTF scenarios, and feel good that they can shoot at their leisure too. 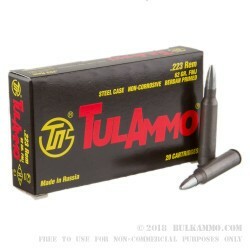 Tula reports a muzzle velocity of 3,025 feet per second with this 62 grain round. Note: this ammunition does behave best when you are using a firearm that is not match tolerances, and which offers an aggressive set of springs and extraction methodology. It is cheap, plentiful and reliable and offers a great shooting experience for most .223 shooters. Q: Are they reload able ? A: Hello Vernon, Unfortunately Tula does not recommend for safety reasons that any steel cases are reloaded. A: Steel cased ammo offers some advantages over brass, namely in that cost is reduced. One advantage brass has in rifles such as the AR-15 is that brass obturates, or expands to seal against the walls of the chamber, during firing. It also shrinks back to its normal size just before the extraction process begins. Steel does not seal against the walls of the chamber, allowing some carbon to adhere to the chamber. As long as steel cased ammo continues to be fired, this hardly ever becomes a problem. However, if steel ammo is fired before brass cased ammo, the brass ammo won't have the amount of room inside the chamber that it is designed to work with, because of the carbon buildup. If you clean the chamber in between shooting steel and brass cased ammo, this should not become an issue for you. Q: What are the main differences between steel case and brass cases? Are there any drawbacks to firing steel cased ammo as opposed to the brass cased? Thank you in advance for information you may divulge. A: The biggest difference is in how the two behave when fired. Steel cases do not "obturate" like brass, or expand to fill the chamber. As a result, an extremely thin layer of carbon can build up on the walls of the chamber when firing steel ammo. As long as steel ammo continues to be fired, this is not really a problem, although an extremely small percentage of stuck cases may occur after firing steel for long periods of time - say, several thousand rounds. 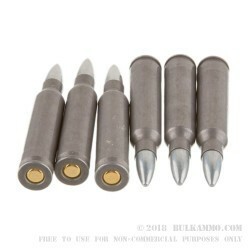 When brass ammo is fired through a rifle that has had significant amounts of steel fired through it, though, the expanding brass case can get stuck in the chamber because of the carbon buildup on the walls. Q: Will shooting ammo with steel casings damage my gun? A: Your firearm sees repeated spikes in pressure to 60,000 psi every time it is fired. It deals with extreme heat during this process, as well. The fact that these Tula cases are made of a soft steel instead of brass is not going to cause any more damage than the massive forces that are already being placed on its components.